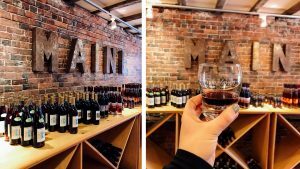 If you are looking to experience Maine I’ve got the ultimate list for you! This post was written in collaboration with many of the places listed below, however all opinions expressed are 100% my own. Looking for your next trip, family vacation, just you and your significant other or want to go somewhere with friends. 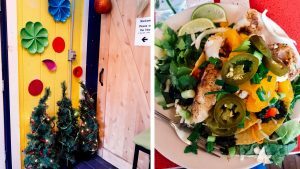 Winter or summer Portland Maine is a magical place to visit with great eats! I’m from Maine, but I didn’t grow up in Portland and we didn’t go walk around the city when I was a child. Only until moved away and became a young adult did I fully experience and fall in love with the city of Portland. In fact, my husband and I dream of maybe moving to the area one day. So where to go? What to do? The Westin hands down is the most gorgeous hotel to stay in. Not only is the decor nice in the main areas the rooms are cozy and up to date. My mom travels a lot for work and she claims Westin’s have the best beds.. so their is that too. 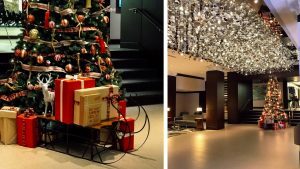 The Westin is a happening location for everyone in Portland. The rooftop bar itself is such a fun location to hang out. Many locals come to the hotel just to spend an evening up at the rooftop bar. They have mouth watering nibbles and duh, delicious drinks. This was one of our favorite places to hang once settling in at the hotel for the evening or in-between our daytime adventures. They have high tops, tables and comfy couch areas. Even if you don’t stay at the Westin, you have to check out this gorgeous hotel and their rooftop bar. But really guys, if you are going to be in Portland, may as well stay where everyone wants to be? Am I right? I love a good snow view. “Amazin beeaahhh!” Did you read that in a Mainer accent? 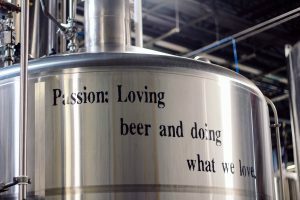 Allagash not only crafts amazing beers, but they give their employees the chance to pitch ideas as well. If your idea makes it through, your pilot beer gets brewed! How cool is that? This company is full of passion, love and creativity! 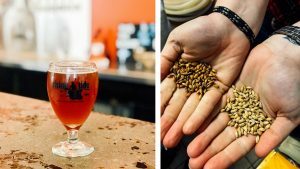 Did you know this company really paved the way for craft beers in Maine? The founder Rob had many times he thought he’d have to shut the doors and call it quits. But he was persistent and the dream he had started in 1995 become bigger than I think he had imagined. Right now Allagash is the 35th largest craft brewery in the country. 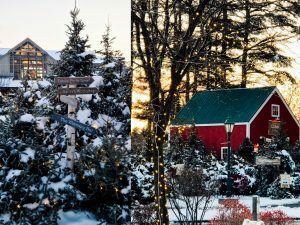 Beyond treating their employees and customers who come in like family Allagash also is involved in giving back to the community. In fact on each beer you can read what part of the proceeds go towards. One we recently bought back in our home state, helps keep homes warm in the cold winter months of Maine. I think it speaks volumes when multiple companies are speaking highly of you! So many places, shops and restaurants in Portland had only amazing things to say about your beer, staff and charity work so keep it up. 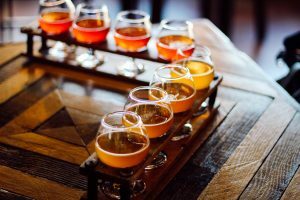 If you thought you hated sour beers, like I thought I did... try some at Allagash! I was pleasantly surprised and truthfully the one I had may be one of my favorites. 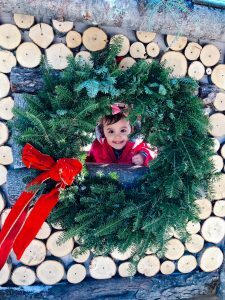 The atmosphere at Allagash is warm, cozy and rustic. The perfect place to stumble in on a cold winter day or hot summer afternoon… so ya… year round! Go try out all the beers because nothing is more fun than tastings right? More about the beer?! The wheat used is locally sourced plus the water in Maine is amazing so naturally a boss Maine beer will be crafted. All the left over gain does not go to waste. It goes to local farms to feed the animals. 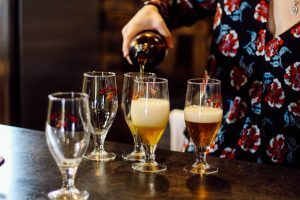 Allagash was created with Belgium style brewing in mind, hence all the super cool ways they craft their beers. Also they currently are using an energy efficient system with an internal heating element called Braukon. This is very engird saving and fun fact, it was built in Germany. One of the things that really wowed me was the way Coolship beers are crafted. This is a much longer process because they allow for spontaneous fermentation. Thank you Allagash for the amazing tour of your brewery & sharing that true northern hospitality I’ve been missing while living in the south. 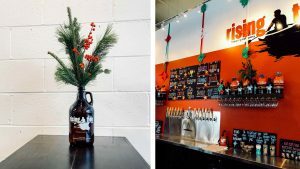 I could go on and on about the amazingly delicious beer choices, your cozy atmosphere and best of all the friendly and inviting staff you have on board. Another great brewery in Maine. We had the pleasure of going on a tour and learning more about. Rising Tide Brewery opened in 2010 and is family owned by husband and wife. It all started because they would always have home brewed beer at their parties and their friends/family loved it. So they decided to go after a passion of theirs. Heather and David (the founders) love sailing and being outdoors. This brand is all about having an active outdoor lifestyle and taking your beers with you to drink after those activities. 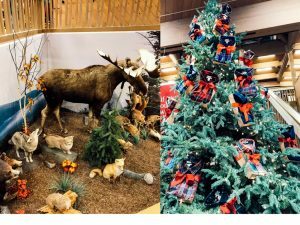 They partner with the Maine Island Trail Association. This is a non profit that offers stewardship to islands and basically helps clean up the trails and coasts. 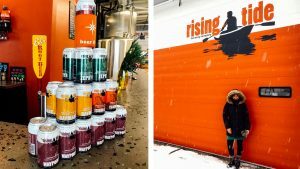 Like Allagash, sustainability is big over at Rising Tide. They also donate gains and their hops are composted. More about the beer?! They have such a big, fun and bright tasting space. They have variety however majority of the beers are pale ales. So if that’s your thing.. check them out! Thank you Rising Tide for the tour and kindness! Your staff and beer were awesome. Sweetgrass was such a fun place to pop in grab some goodies to go after a tasting. 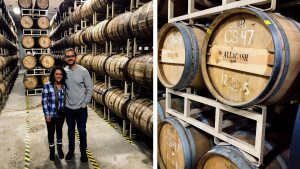 We visited the tasting room called Sweetgrass Old Port in Portland. 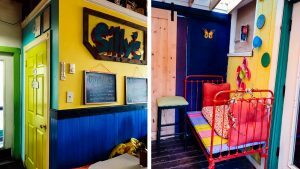 It’s adorable inside with fun rustic decor & plenty of space to sit or stand and look around. 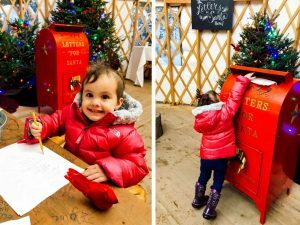 If you want to visit the winery that is located in Union ME. We had the pleasure of meeting one of the owners, Constance, when popping in. She was super sweet and gave us a lot of information on everything the tasting list had to offer. Constance’s husband Keith earned his MS in Food Science in winemaking (Enology, actually) at the University of California at Davis. That’s pretty big deal! Definitely check out this little gem! The Bayside American Cafe was super cute & quaint! The staff was very friendly & the decor had a vintage vibe. The food was a mixture of unique & traditional breakfast items. Joe dove into bacon cheddar scallion pancakes with bourbon bacon syrup. I got veggie home fries, which were AMAZING. Izzy got a side of fresh fruit, which was more like a giant bowl of phenomenal fruit. This is a MUST visit. 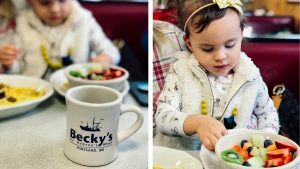 Becky’s has been featured on Diner’s Drive-Ins and Dives. You may have heard of that show… if you are food obsessed. Izzy’s small fruit bowl was massive and filled with the most delicious, colorful and fresh fruit you could imagine. You’ll find lobster is available on the menu even for breakfast, for example their lobster omelet. Izzy’s favorite part was looking at the lobsters in the tank. 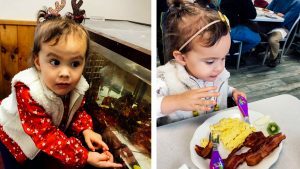 One day we actually sat in the booth behind it so before and after eating she got right up to the glass inspecting and asking questions about all the lobsters. Pizza anyone? Not only is the food amazing Flatbreads big about giving back to the community. In fact the night we went they were giving a % of the proceeds to a charity created by a local. This is something they regularly do. 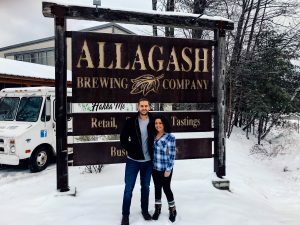 They noted Allagash has been a big supporter of their charities as well and even matched the money that was made by Flatbread at a large charity event. The gluten free pizza is the BEST I’ve had and I’ve pretty much tried it all at this point. The meats and veggies are nitrate and hormone free? The salads are so fresh and flavorful! I suggest getting one as an appetizer for everyone to take a little bit of. For sizing, I think you could share as an app with 4 people max. Oh and our waiter suggested that you eat the crust by dipping it in the house dressing… um yes! Do that! If you have a choice for seating, sit by the oven so you can watch your pizza cook. Plus if you go in the winter, it’s extra cozy! Izzy is a self proclaimed pizza snob and devoured her pizza… so I think that says a lot. I’m a pizza snob too, specially since I eat gluten free crust. 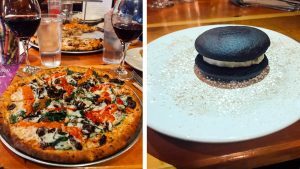 Not all gluten free crusts are created equal! This crust tasted closest to a gluten filled crust! A-Mazing! If you are gluten free and also can’t have dairy they have a gluten free/vegan whoopie pie! You can have it heated up or not, whatever you chose. 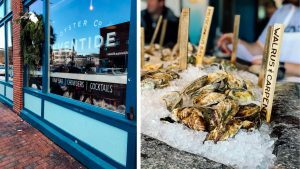 If you want Oysters while visiting Maine… Eventide is THE PLACE to go! 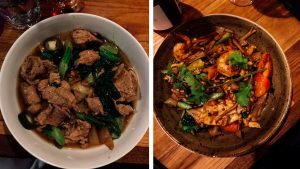 Boda has an Asian/industrial feel that is cozy & dark. Perfect for a date night, girls night or even family night. Izzy has eaten at Boda twice now and she loved the buzzing atmosphere. 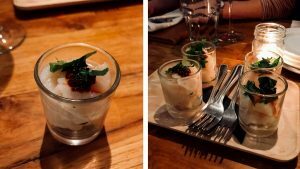 You can read more about Boda here as I actually reviewed them in the past, and of course had to visit again and add them to my list. To make it easy, if you are gluten free the whole menu is marked for you. Takes the guessing game out when ordering. Silly’s was like nothing I’ve ever been to. From the decor to the staff, to the menu. Everything and everyone was bright and cheery. The food was colorful just like the decor and extremely flavorful. 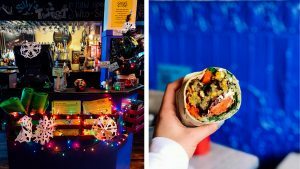 This menu marks vegan, gluten free and vegetarian options. Izzy loved the pasta and milkshakes, while Joe and I dove into some unique dishes on the menu. There are so many fun activities for your kid(s) to play while visiting the museum. It’s also fun for you to join in and engage with them. 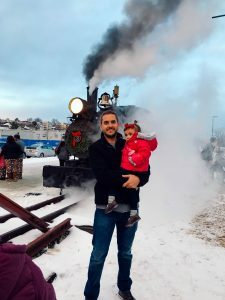 In the Winter you can experience the Polar Express. 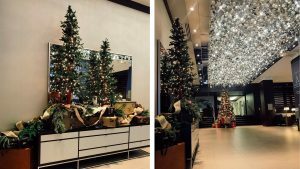 I highly suggest you look into it if you are visiting Portland Maine around the holidays. Guys have such a blast in Maine! And remember it’s not only Vacationland in the summer! I’ve alwahs wanted to go to Maine. Now you’re making it seem even more dreamy! It’s seriously a foodies dream! 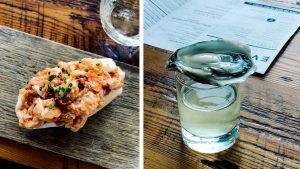 Eventide has the best oysters and lobster rolls on the planet! Flatbreads has the best pizza! The Westin has the best beds! Allagash is the coolest brewery I have ever visited! 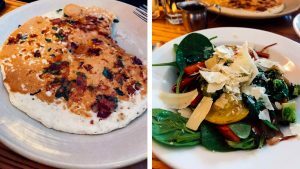 You have picked the absolute best places in Portland!! I LOVE Portland and really want to do another trip there this summer!! I’m definitely going to hold onto this guide for planning it! Looks like you had an amazing trip, love all the photos! 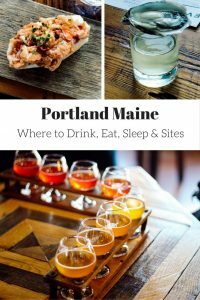 I have never been to Maine but I would love to go someday and try some of the delicious food!! Yes the food is crazy good! We’re hoping to visit Maine in the next couple of years! Def. saving this list! Your trip looks AMAZING! I have never been to Maine but I’m saving all of your ideas. My husband would love all the beer spots..ha ha! We went to Maine for our honeymoon, what a fun reminder of out time there! 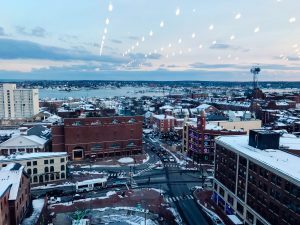 I know I’ve told you this before, but we absolutely LOVE portland maine! 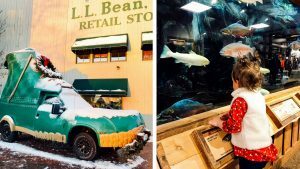 Flatbreads and LL Bean are our faves! There’s just so much to do!! 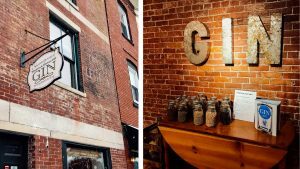 I can’t wait to check out the rest of these places on our next trip! Yay! A fellow flatbreads lover!! This looks like such an amazing trip!